Our six bedroom, 3 1/2 Bath home is just waiting for you. Whether it's a wedding party, families sharing a ski or lake holiday or your business family's reward for a job well-done, our house is just right. Just 1/4 mile below the lifts at Heavenly California and just 1/2 mile above the lake (BEACH), it's the perfect location, no matter where you're headed. We're also less than a mile to the casinos and the fabulous new Heavenly Village, where you can find the best meals, the best shops at the Lake. There's ice skating and a new theater too. It's a great spot for the family. Let them test their luck in the new arcade while you taste the best wines at the Village's new wine shop. The house comes completely furnished, with a fully loaded kitchen for those "stay at home feasts". Head downstairs to the pool table and wait your turn at the bar or open your lap-top for HIGH-SPEED WIFI internet connection. Our place has it all!!! There are 4 parking spots, 2 in the garage and 2 in the driveway. Brand new gas bbq, 52" SONY AND WIFI. So bring your laptops. There are 5 TV's. Pool table and Ping Pong. Backyard view, checkout family sized spa. Stayed at this cabin for my 40th birthday with my friends and family and it was perfect. We had 16 people and it fit all of us. The deck and hot tub were great, as well as the pool and ping pong table downstairs. The open kitchen, living room and dinning area made it easy for everyone to be a part of the party. Even though it was a bit 70's inside in certain areas, I would recommend this cabin for a fun Tahoe getaway. This house was huge and had all the amenities you need for a Tahoe getaway! Great location! Heavenly is so close we planned to walk, but the shuttle was kind enough to pick us up along the way. Renting out this place was easy; the keys were sent directly to me. Thanks! The Wildwood Lodge was very spacious and clean. Plenty of room for 8 adults & ski gear. The kitchen and living room have a nice open layout so that everyone was included in the conversations, games, etc. 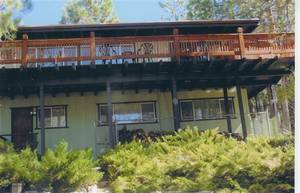 The lodge was centrally located in South Lake Tahoe - short walk or drive to a grocery store, ski shop, as well as Heavenly's base lift. I would strongly recommend both this lodge as well as South Lake Tahoe for a winter ski vacation. If you are coming up with family or a large group of friends, this is your home away from home. Rex is an efficient homeowner as he worked with me quickly answering questions, responding to emails and taking my phone calls! I appreciate efficiency since we are all busy people. We stayed at this home Oct 24-26, 2008 with several friends (3 couples, 2 singles and a baby) and found the home to be HUGE, which was great. We could all spread out. We loved the big dinner table that accommodated all of us. And we enjoyed using the deck and the hot tub. Everything worked perfectly and Rex provides you with a list of all of the details before you arrive. 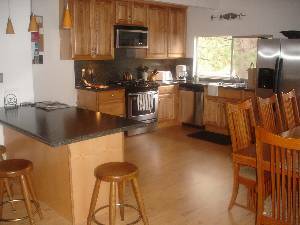 The house was clean and the kitchen is updated and pretty much has everything you need to cook breakfast, lunch or dinner. It's just as you see in the photos. In addition, you will never ever run out of hot water in this place -- which I can see looking forward to after a nice day of boarding or skiing. We look forward to coming back when there is snow as this place is a block or two from the Heavenly Calif. Lodge. We rented Wildwood for a week at the end of August 2008 as ew brought our childrn and grandchildren together. There were ten of us and the house was just what we hoped for. The rooms are spacious. The amenities are excellent. It was easy to communicate with Rex to make the arrangements. The location was ideal. It is actually a little more than a mile to the casinos and the lake but that was no problem. Everything was clean and comfortable. The kids liked having a pool table available. We would definitely come back and recommend it to anyone. 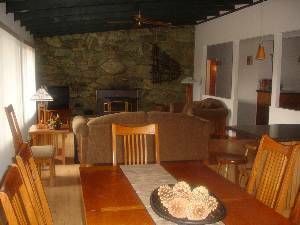 The Wildwood house has been an excellent ski rental for a big group (10+), often couples with kids. Rex, the landlord, has been more than accommodating when we were in a pinch, we've never had problems with the deposit, and everything has been in working order - the hot tub's hot, the fireplace has wood, the kitchen has the cooking supplies you'll need (although we always bring better knives), and the bathrooms have plenty of clean towels. The open kitchen/living area is great for group socializing and dinner together at the table. As long as you're not fussed about a little 1970's wallpaper, this is a prime rental. This house was great! I had my wedding at Heavenly just up the street, and my whole family stayed here. There is plenty of space in the kitchen and living room, and even a game room for the kids. We all had a great time. We had a great experience with this house. We have rented in Lake Tahoe for 20 years for a big group and this was the easiest and one of the best experiences that we have had as well as one of the best values! This was the perfect home for our family vacation. We rent a house every year for the past 20+ years for Super Bowl weekend, it's a large adult group that attends and I found us this rental and we absolutely loved the house. The location was perfect to skiing, restaurants, casinos. The set up is everything we look for in a rental. We would love to rent again next year! We had (4) families and it worked out great. The kids were all able to hang out together down in the rec room in the basement. Our major issue was that we were there during the heatwave in July of `07 and there was NO air conditioning. It was brutally hot upstairs. It actually made it very uncomfortable. Other than that, it was perfect for our 4 families. We had a great time! 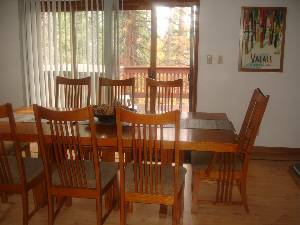 Perfect for a big group--plenty of space and activities and SO close to the ski lifts (we walked no problem!) I would DEFINITELY stay here again...can't imagine a better vacation spot! 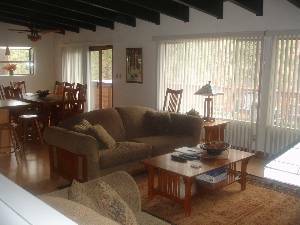 This is a fun house in a great central location in South Lake Tahoe. We enjoyed our annual family reunion in this spacious home. It had many spaces for the children and teens to hang out too! 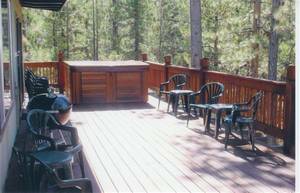 We enjoyed the large deck for barbeques and the hot tub was nice. Excellent home. Great place for a family get-together or a ski weekend. Lots of room for everyone. Perfect location in Tahoe. Very comfortable house. In March 2005, myself and 8 other stayed in this incredible house. The location is exceptional and the house well featured and well equipped. I could not recommend this place more highly. Thank you for adding to what was a great vacation. 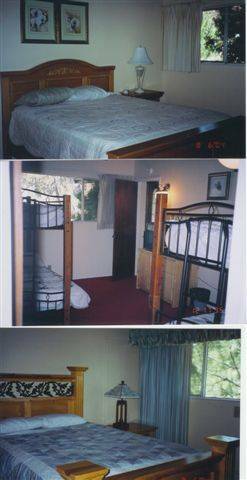 Special rates and bonus days available during spring, fall and sometimes in the summer.Weekends,600-800.$150 cln.fee plus ref. $49 dam.ins. taxes paid. Deposit: $200 booking fee that's applied to balance when balance is due. Ref. if notice 45 days prior to arr. date. Cancellations and Refunds: Final payment required 45 days prior to arrival. Refundable deposit needed to hold rental dates. Cancelled after 30 days, all rent kept.. All returned if rented. Sec.dep.and cl.fee, returned. Other Fees: No security deposit, just $49 for a damage ins. policy.